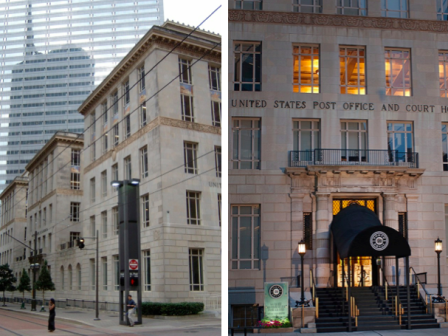 The US Post Office and Courthouse Building had been conceived early in the 20th Century as an opportunity to centralize Federal office and services in a central location for the burgeoning city of Dallas. Land for the site was first obtained about 1912, but funding problems and political infighting prevented the project from beginning construction until 1929. Upon its completion in 1930, the building housed a wide variety of Federal offices and services, most notably the Federal District Court of North Texas. Before relocating to the Cabell Federal Building in the 1970’s, many cases of national importance were heard in that courtroom, including the landmark case of Roe vs. Wade which set national policy on abortion rights. One of the jurists who heard Roe vs. Wade was Judge Sarah T. Hughes. She was a personal friend of President Lyndon Johnson and administered the oath of office to him following President Kennedy’s assassination, the only woman to ever do so for a president. The US Post Office and Courthouse Building was restored in a manner consistent with the Secretary of the Interiors Standards for Rehabilitation and qualified for Federal historic tax credits. The result is a busy post office surrounded by 78 luxury residences designed in a way sympathetic to the historic context of the building. The remaining courtrooms were restored and are available as event and meeting spaces, making them once again available to be visited and appreciated by the public. The restored building is on the local tax rolls for the first time ever and serves as a vibrant building that contributes to the economic revival of Downtown Dallas. The project is also Transit Oriented Development, with limited on-site parking but excellent access to all DART rail services, bus services and with the new extension of the McKinney Ave. Trolley coming to it this year. Transfer from Federal ownership to private ownership. The US Postal Service chose to keep the post office operating and to retain ownership of that portion of the building while selling the surrounding building. This required a complex condominium agreement and a one-year Section 106 process where minute details regarding historic fabric and spatial relations were studied, documented and protected through deed covenants. Stenciled Ceiling Restoration: Instead of the WPA mural so often found in post offices of this era, this building features extensive hand-stenciled ceiling decoration in the primary public spaces in the Ground Floor Lobby and the courtrooms. A decorative arts conservator was retained to clean and restore the ceilings “one cotton swab at a time”. Fire Sprinklers. Working with the Dallas Fire Marshall and the fire protection subcontractor, a creative installation approach was developed that did not touch the stenciled ceilings. General code compliance. With the Federal Government exempt from local code requirements, the transfer to private ownership required extensive modernization and creative negotiation to “catch up” to current codes.